Orig. by controlled cross (‘Clark’ X ‘Odom’) made by L. D. Romberg, USDA-ARS, Brownwood, TX. Cross made in 1942; scion budded into mature tree first fruited in 1948; tested as 42-13-2 by Romberg and G. D. Madden; released in 1970. 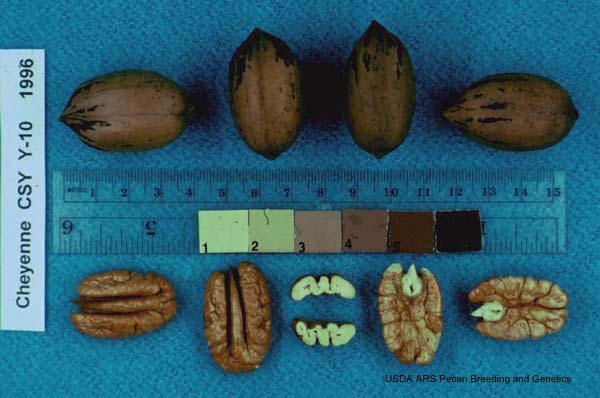 Nut: oval elliptic to elliptic, with acute apex and obtuse base; round in cross-section; 48 nuts/lb, 58% kernel; kernels light cream to cream in color; very wrinkled texture; wide, shallow dorsal grooves. Protandrous, with mid-season pollen shed and mid- to late season pistillate receptivity. Very precocious and prolific. Ripens in late mid-season, shortly after ‘Stuart’. Slow growing, “dwarf” type tree. Very susceptible to yellow aphids. Extracted from here.